Pretzel Logic's Market Charts and Analysis: SPX Update: There's the Breakdown, What Next? 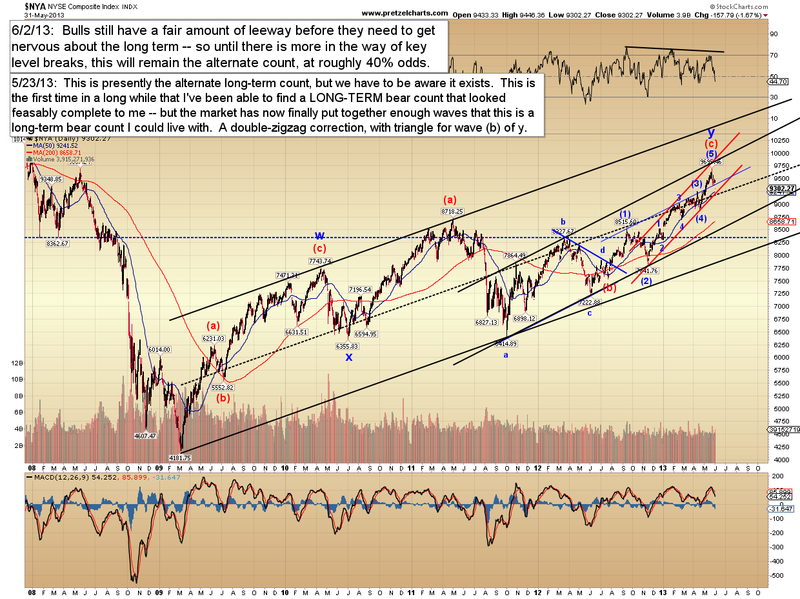 SPX Update: There's the Breakdown, What Next? May was an interesting month, as the S&P 500 (SPX) reached my 1680-90 target zone and promptly reversed in an apparently impulsive decline. That impulsive pattern led me to believe the market would continue to correct lower, so last Tuesday, I outlined the reasons I believed we should sell the bounce; and on Wednesday, I upped my odds on a breakdown from 65% to 70%. On Friday, the S&P 500 (SPX) actually broke down, so now we can take a look at targets with additional detail, as well as revisit the bull and bear long-term wave counts. 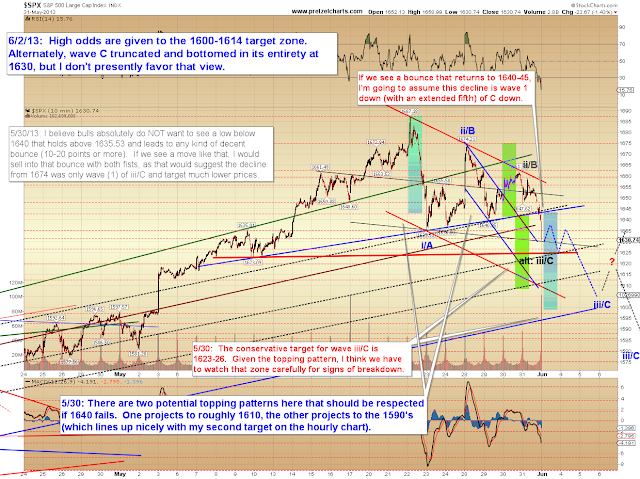 My first target from last week was 1620-1629, and that target zone was almost reached on Friday (1630). However, given the charts at this exact moment, it presently appears unlikely that the decline will end there. 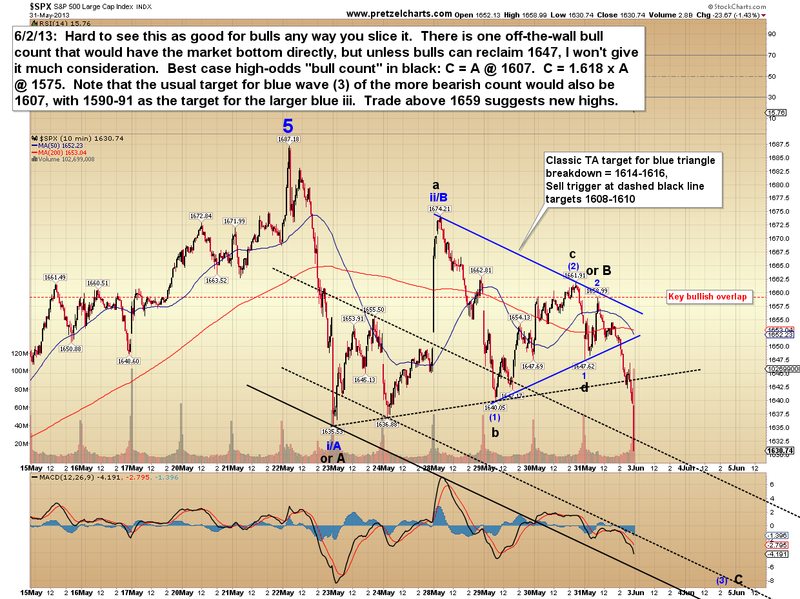 There is a cluster of targets in the 1600-1614 zone, so with Friday's strong thrust lower, that's the target zone to which we're going to give the most weight for the moment. 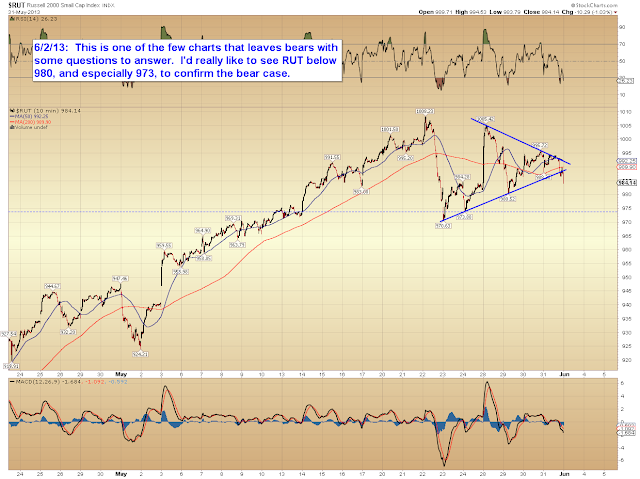 The chart below shows the most obvious counts of the near-term. 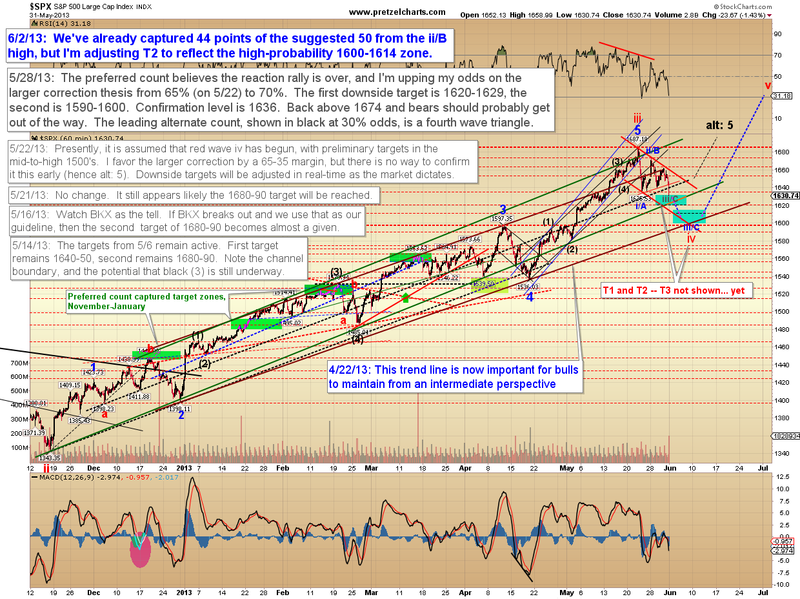 Sustained trade above 1659 would invalidate many bear options, and suggest new highs. The hourly SPX chart remains largely unchanged since May 28, but I have adjusted target 2 to reflect the discussion above. 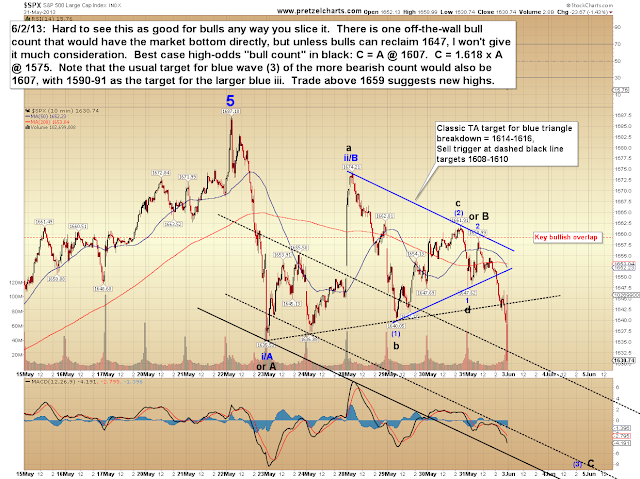 We'll reexamine this as the wave unfolds, as the potential for a deeper decline is quite valid. 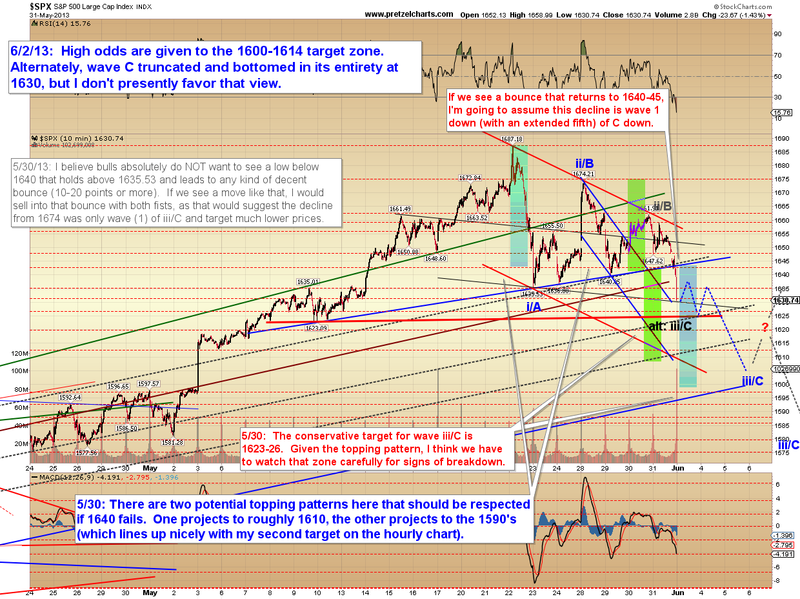 Thursday's chart is updated below, with a slight bit of fine-tuning. An option mentioned but not shown is the possibility that Friday's drop was wave (1) of C, thrusting out of a triangle, but that's a very tough call. 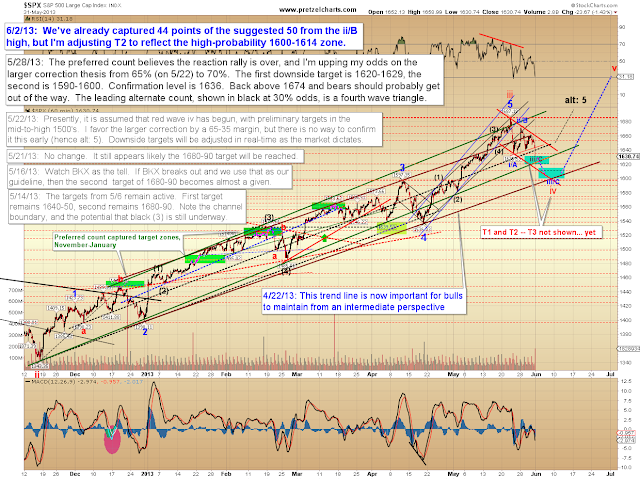 There's lots of bearish-looking stuff, but let's take a quick look at the flip side of that equation. There is one chart that has left a few questions: the Russell 2000 (RUT). RUT looks suspiciously like a complete fourth wave triangle. Keep this in mind when considering the alternate count that wave C truncated (noted above), and we'll take a look at this chart again soon. 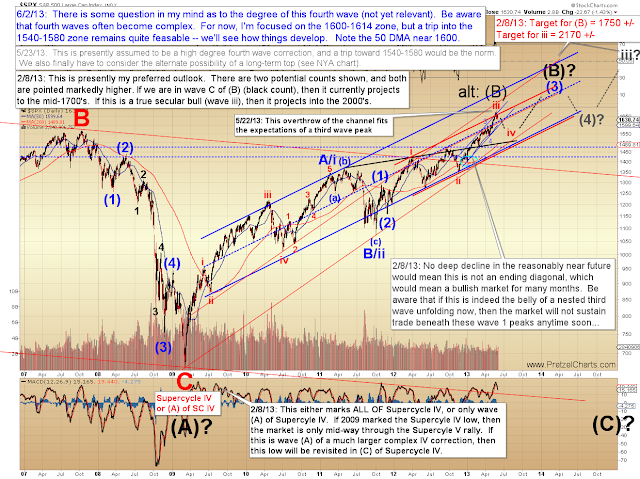 Moving away from the near-term discussions, when we back out and look at the big picture, it presently appears likely that this is simply a corrective decline to an ongoing bull wave. Of minor technical note, I am also still more inclined to believe this is a corrective bull market, as opposed to a true secular bull (see annotation from 2/8/13). Of near-term relevance, the 50 day moving average crosses 1600, which adds to the cluster of targets mentioned earlier. If this is a fourth wave at minor degree (shown above as red wave iv), it will probably get ugly and confusing at some point, and leave bulls and bears alike scratching their heads trying to figure out what the market's going to do next. The market tends to alternate between trending waves and cycling waves, and fourth wave corrections in a bull move usually cycle in a sideways-down fashion. They trend near-term, but then stop and grind around just when you think they're going somewhere, chewing up accounts and driving all but the nimblest traders nuts. From my perspective, we haven't reached that point just yet, so enjoy the clarity while it lasts (though I suppose that sense of clarity is subjective and based on the fact that I expected this drop -- some folks may have already been chewed up during the sideways grind last week, so this wave may have accomplished its mission). There is also the possibility that the entire rally has ended, as I discussed on May 23 -- however I'm still giving that option lower odds. The chart below shows that alternate long-term bearish potential, which illustrates that it is possible to count the rally since 2009 as a complete correction. This would also make the bull market the middle wave of a massive fourth wave at Supercycle degree (a huge order of magnitude larger than the assumed minor wave iv discussed above). In conclusion, the breakdown I was expecting has now come to pass, and given how the market has rewarded dip buyers, I suspect there are a lot of bulls trapped in that topping pattern. If the market revisits that topping zone, I would presently expect it to encounter solid resistance, so I'm still giving good odds to lower prices. Let's not get complacent though, because theoretically the market has completed the absolute bare minimum expectations for the decline I was anticipating -- so I would reexamine my expectations for lower prices if SPX sustains trade above 1659. To summarize: for the near-term, a bounce would be reasonable; intermediate-term, I expect lower prices (barring sustained trade above 1659); and long-term I expect higher prices. Trade safe. Can you approve my account on the forums? I've posted on this site several times. Such cases carry many emotional points as well. his or her own background.